Posted February 5, 2019 & filed under Fun Stuff, GET ORGANIZED WITHOUT LOSING IT. Ok, yes, it’s February, and you’re probably already feeling guilty about those New Year’s resolutions. But in my view February is an even better month to change something up. The weather’s lousy, the kids are in school, the decorations are put away…and now nobody’s judging you. As creatives – or librarians or teachers or parents – we always feel like we’re trying to juggle our work with life. Especially for those of us who work independently, this is a challenge. It’s too easy to put aside the tough writing work for a load of laundry or a pile of bills. And it’s my personal conviction that Marie Kondo has it right: when our lives are disorganized, we feel out of control and out of sorts. 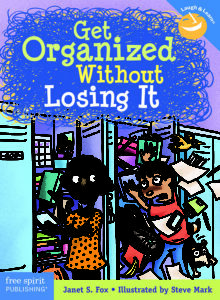 Back in the day, when I wrote the first edition of GET ORGANIZED WITHOUT LOSING IT (Free Spirit Publishing, new edition 2017), my purpose was to help kids – especially middle school kids – transition to a more independent way of managing their lives in school and out. Along the way I did a lot of research on organizational skills, and I found principles that apply whether you are a kid or not. If you’ll join me, for the next few weeks or however long it takes, I’m going to explore some of the organizational ideas I discovered in my research. There are three basic areas of our lives that require some sort of organization. First is “stuff management”. (This is where Marie Kondo excels.) All those things we collect, from clothing to papers, can easily become clutter. What do we do with all that stuff? Second is “time management”. Especially if you are a creative, you need to consciously find time to create and not procrastinate. How can you do that and manage life, too? Third is “information management”. You need to know what you need to know, and no more, but how is that possible? When I wrote GET ORGANIZED, in addition to uncovering these fundamentals, I also unearthed a treasure trove of coping skills, techniques, tricks, and strategies. Many of these are covered in my book, with an eye toward what kids need. But many had to be left out because there either wasn’t enough room, or they were more relevant to adults. Next week (and for however long it takes), I’ll give you some of those tips that I learned for managing your stuff. After that I’ll tackle time and information. These posts will be directed at adults, but can be applied to kids as well. Please ask me questions if you need help in one specific area, and I’ll try to answer. I hope these posts will help as you follow along! Have I ever told you this book is the first way I learned about you? I had a copy in my classroom! No! That’s so awesome!! It still sells like hotcakes, that little book. The new edition is really nicely done. BTW, I love your blog!